Behold our beautifully finished space saving wall mounted cue rack. 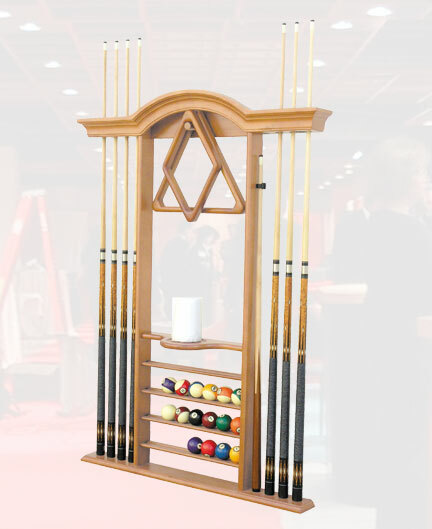 ABC Billiard Plus offers you this solid maple unit with oak finish that’s as beautiful as it is functional. Holds your favourite ball set, 8 cues and features hooks for a triangle and a nine ball rack*. 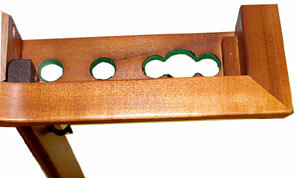 Integrated chalk post and exclusive bridge slot. Also serves as an ideal shelf for chalk, brushes and other accessories. Available in popular finishes to match your room's decor. *Ball racks and brushes not included. •	Width: 37" x Depth: 4" x Height: 52"